The practical test is tough! You need to make sure you are well prepared and confident with the entire driving curriculum. The practical test lasts around 40 minutes and you will be taken on a route from the test centre. The examiner will mark down any dangerous, serious or minor faults he observes. A single serious or dangerous fault will result in not passing the test, additionally accumulating over 15 minor faults will have the same outcome. Should you receive 3 minor faults in the same category the fault may be considered habitual and the examiner may not permit you to pass the test. On route the examiner will ask you perform 1 out of 4 possible driving manoeuvres. You may be asked either to reverse around a corner, reverse into a parking bay, parallel park or perform a turn in the road. The test also requires learners to "self-drive". Throughout the test the examiner will give the learner clear directions on where to go. In the "self-drive" section the learner is asked to follow a sequence of directions or pay attention to specific road signs. The driver then drives independently following this route without any prompting from the examiner. This section lasts approximately 10 minutes ,however is often subject to time restrictions. 1 in 3 tests also involve an emergency stop. This does not count as one of the manoeuvres and is in addition to the other compulsory manoeuver. Applying for the test is similar to the theory and best done online, alternatively I am happy to book it for you. The waiting list depends on which test centre you apply for, but don't be surprised as some centres are booked up to 3 months in advance. When booking you will need your license number and theory test pass number, so make sure you have those available. The DSA test fee can be checked here. 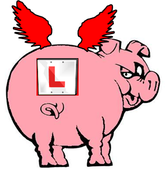 Remember however an additional test fee is payable to the driving school for the use of the vehicle and we recommend a lesson before the test to iron out your nerves. Check our special driving test package here. Once you’ve passed your practical driving test, you can apply for a full driving licence and get out on the road! Get in touch with the DVLA to swap your test pass certificate and provisional driving licence for a full licence as soon as possible. Then talk to me about follow up lessons for further training to complete your skill set for todays motoring.